Corey Steel Company has been distributing copper and copper alloy products since the company’s inception. 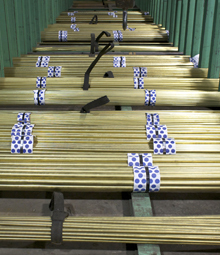 Various grades of brass can be found in our inventory. As one of the leading long products suppliers to the screw machine industry our copper alloy products find their way into such products as hydraulic fittings, electrical connectors, plumbing supplies, lawn and garden products, automotive parts and musical instruments. Any non-standard grade, shape or size can be sourced for special applications. Once a supplier is found, Corey will work as an integral part of the supply chain to insure that you have the right amount of material available to satisfy your requirements. PLEASE CLICK ON THE LINKS BELOW TO VIEW SIZES, GRADES AND TYPES OF COPPER ALLOYS WE CARRY.